We arrived just before 7 am and there was still plenty of parking. 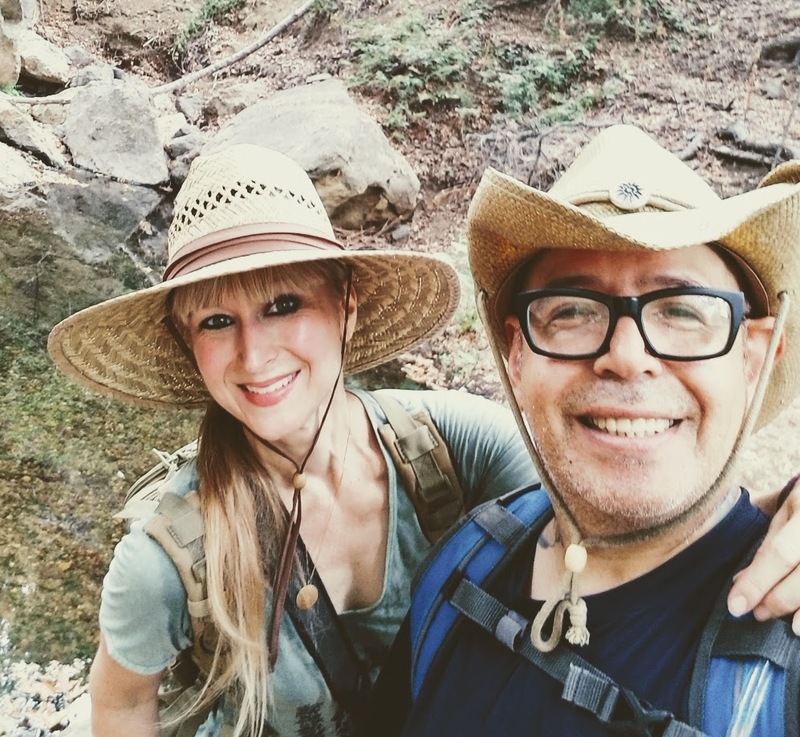 Our options were to head straight to the falls via the Solstice Canyon Trail, an easy walk down a paved fire road, or to head up the stairs to the right and take the Rising Sun Trail which climbs upward on more rugged terrain. We opted for the later. Just a few yards in we were already getting some nice views of the pacific. The morning light was gorgeous and it reflected a beautiful golden hue on the summer wildflowers along the trail. It was still early in the morning, but the exposed hills had us working up a good sweat. As we reached the crest, the first view of what remains of Tropical Terrace mansion became visible down in the canyon. This mansion was built in the 1950s, but it burned down in 1982 in a wildfire. As we began to descend down into the canyon towards the ruins, we could hear the waterfall and the vegetation became noticeably greener. We spent some time exploring Tropical Terrace and the small but very pretty Solstice Canyon waterfall. Afterwards, we walked south along the paved Solstice Canyon trail for a quick minute to pick up the Sostomo Trail. The Sostomo Trail took us straight up on a less maintained more difficult trail to some very pretty views of the whole canyon and the pacific ocean. We passed the ruins of a few more cabins along the way, dropped down in the canyon and rock hopped over the creek a few times and eventually reached the junction of the Deer Valley Loop. The Deer Valley Loop took us up even higher where we were able to get a birdseye view of Point Dume. There were some parts of the loop that leveled off and opened up to meadows full of golden wildflowers and also beautiful Oaks. This area was covered in white butterflies. I believe they were Cabbage Whites, but they kept us company almost our entire time on these two trails. I should note some of the other butterflies I saw here which were Swallowtails, Skippers and Marine Blues. Steps at the trailhead leading up to the Rising Sun Trail which takes you to Tropical Terrace and the Solstice Canyon Falls. You can also take the easier, paved Solstice Canyon Trail directly there, but if you want to do a little work, take Rising Sun. First view of the ocean just a few minutes up the ascent. Climbing up the Rising Sun Trail. Rising Sun Trail - Nice views of the canyon. The first view of Tropical Terrace came into view as we made our descent into the canyon. Everything starts to get a little greener as you go down and finally get into some shade. Tropical Terrace, "Roberts Home" - Built in the 1950s and burned in a wildfire in 1982. Stairs leading to Solstice Canyon Falls. Solstice Canyon Falls. It's a little waterfall, but it's very pretty. Beautiful maidenhair fern along the canyon walls. Just south of Tropical Terrace, we picked up the Sostomo Trail and started another climb. Sostomo Trail gave us beautiful views of the entire canyon. It also descends back down into the canyon where we rock hopped over the creek a few times. You'll also get to see some ruins on this trail of more homes that burned in the wildfires. Some beautiful oak and meadows when you get to the Deer Valley Loop. Lots of butterflies along this entire trip. Another view from Deer Valley Loop.